Some performers seem to have nine lives. Others, like, say, Kurt Cobain, aren’t so lucky. Some performers seem to successfully re-invent themselves on a regular basis: David Bowie, Jack White, and Elvis Costello are a few contemporary artists who come to mind. And then there are artists who suddenly treat us to an unexpected revival. One last artistic gasp. Out of the blue. Who knows why? One would like to think they did it but because their relentless artistic muse compelled them to create — not because they needed the dough. Yeah, right, and I’ll be starting on the mound for the Indians tomorrow night. But, remember a few years ago when Tony Bennett was suddenly all the rage? They couldn’t print tickets fast enough for his shows at the 9:30 Club — DC’s premiere rock n’ roll venue. How about Leonard Cohen? Seventy-four years-old and currently on tour — playing sold out shows night after night. I didn’t even know he was still alive. And then there’s Tom Jones. Wait, stop laughing. I’m being serious here. I’m not embarrassed to admit that back in the day when I used to record songs off AM Top 40 Radio, I had more than one song by Tom Jones on tape. “She’s a Lady” “It’s Not Unusual” “Delilah” And of course, “Thunderball.” All classic stuff with a whiff of smaltz, but catchy as hell. Seriously, when’s the last time you were at a concert and the woman standing next to you took off her underwear and threw it at the singer on the stage? I’ll tell you when. Never. And I’ve been to a lot of concerts. So ten years ago Tom drags his bulk out of early retirement and releases a brilliant album of duets and collaborations called Reload, that “puts him back on the musical map for a whole new generation of music fans.” There’s “Burning Down the House” with The Cardigans, “All Mine” with The Divine Comedy, and “Lust For Life” with The Pretenders, just to name a few. But my favorite track on the album is actually a song with an interesting history. It was originally written by Randy Newman for Eric Burdon who recorded it with The Animals. That single was never released, however the song eventually turned up on the 1967 album Eric is Here. Three years later, Randy took a shot at recording the song himself; slowed down and funked up, but it failed to even crack the charts. Three Dog Night didn’t have that problem. Their recording, also released in 1970, was a number 1 hit for two weeks (in between “The Love You Save” by The Jackson 5 and “(They Long To Be) Close to You” by The Carpenters.) 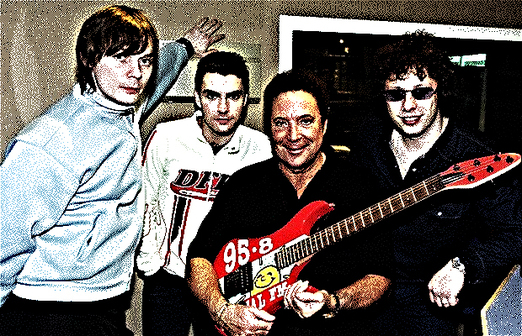 “Mama Told Me Not To Come” —performed by Tom Jones and The Stereophonics — is my favorite cut on Reload. It’s also the Happy Medium Song of the Day. Just in time to get things rockin’ on Sunday for Mother’s day.